The Virtual Physiological Human (VPH) has previously been defined as "a methodological and technological framework that, once established, will enable collaborative investigation of the human body as a single complex system". As part of this initiative, the primary purpose of the network will be to function as a service to the community of VPH researchers. Its aims range from the development of a VPH toolkit and associated infrastructural resources, through integration of models and data across the various relevant levels of physiological structure and functional organization, to VPH community building and support. a library of open-source computational routines and graphical user interfaces (GUIs). Several partners of the network will develop exemplar projects to support interdisciplinary and integrative research, with the aim being to address specific research problems or challenges. The ERCIM Digital Patient Working Group, for example, proposes a project on modelling and visualizing brain function and pathophysiology. Other projects are concentrating on a multi-organ core model of arterial pressure and body fluids homeostasis; integrated multi-level modelling of the musculoskeletal system; fighting aneurysmal disease; and multiscale simulation and prediction of the drug safety problems related with hERG (human Ether-a-go-go Related Gene). 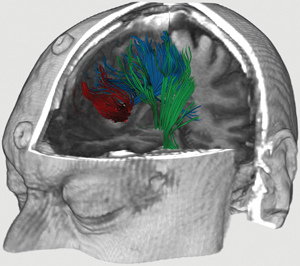 Overlay of a patient's tractography (a procedure to demonstrate the neural tracts) with anatomic magnetic resonance imaging. This allows a medical expert to better visualize and localise neuronal fibres. Modelling and visualizing brain function and pathophysiology is one of the exemplar projects proposed by the ERCIM Working Group Digital Patient. © INRIA/ASCLEIPOS. As one of the thirteen VPH NoE core members, ERCIM is responsible for communication and information dissemination within and beyond the network, together with Universite Libre de Bruxelles. In addition to the core membership a general and associate membership of the VPH NoE has also been created, to ensure wider engagement of the research community. The network currently counts 29 associated and general members. Associate and general membership is open to any interested institution, organization or company with an interest in the work of the VPH NoE, and will be subject to a collaboration agreement. A publicly accessible forum at the network's Web site offers the possibility to discuss VPH topics with the network members (see link below). VPH NoE is actively participating in ICT-BIO 2008, the second conference on Computer Modelling and Simulation for Improving Human Health, which will be held on 23-24 October 2008 in Brussels, Belgium. The event is organized by the European Commission Directorates-General 'Information Society and Media' and 'Research', in cooperation with the US National Institutes of Health. Prior to the conference, VPH NoE is organizing a 'Concertation Meeting' with VPH-related projects of DG Information Society on 22 October 2008. This meeting is restricted to project representatives. A summary report is expected to be published by the end of November 2008.